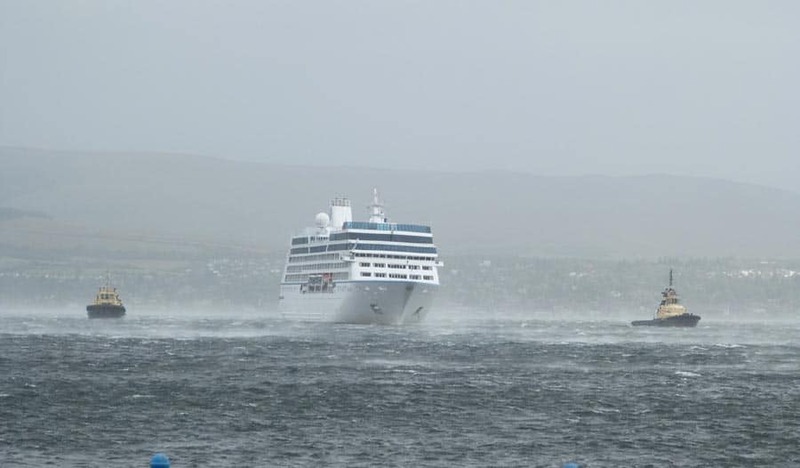 A cruise ship has broken free from its moorings in Greenock, Scotland this morning due to the strong winds of Storm Ali. The ship has needed assistance from tugs as the storm pounds northern parts of the UK. The luxury cruise ship Nautica which is operated by Oceania Cruises has broken free from its mooring lines at around 11 AM on Wednesday, September 19. It happened while the vessel was making a port of call in Greenock, Scotland. Unfortunately Storm Ali was hitting the region with up to 85 mph winds and as a result, this bad weather caused the ship to break free. The winds have already weakened since then but still poses a great risk. “Tugs have been called in to assist and the vessel is currently being held off of her berth. All 478 guests and the 26 crew members are safe and those passengers who were on land at the time are being taken care of by a shoreside operations team. Tugs are being used to keep the Nautica stable away from the dock and when the high winds weaken the ship will dock again. There is also a pilot onboard as the ship is anchored. The Oceania cruise ship is currently sailing a 12-night cruise around the British Isles and departed Southampton, UK on September 14. Nautica is a small luxury ship which can often sail to ports which larger ships can’t. The vessel is 30,200 gross tons.